How, when, and why does conservation ethics influence policy? Whereas in the past wolf management in Michigan was restricted to recovery, today, managers must contend with range expansion and post-recovery issues including policy changes (e.g., federal delisting, regulated hunting seasons); public responses to policy change (e.g., lawsuits, public votes, media coverage, poaching); and balancing preferences, tolerance, and behaviors of traditional and non-traditional wildlife stakeholders both within and outside Michigan. 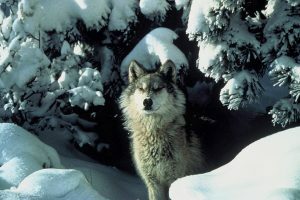 This research explored the extent to which residents: (1) value wolves, (2) are interested in hunting wolves, (3) believe a decision to hunt wolves should be made by public vote and (4) are committed to sound science as a necessary component of wolf management decisions about hunting. Results suggest there is currently agreement among groups throughout Michigan regarding attitudes toward wolf hunting. Moral dimensions of human-wildlife conflict. Lute, M. L., Navarrete, C. D., Nelson, M. P, and M. L. Gore. (2016). Conservation Biology. Identity-driven differences in stakeholder concerns about hunting wolves. Lute, M.L., Bump, A., and M. L. Gore (2014). PLoS ONE. Exploring knowledge and power in Michigan wolf management. Journal of Wildlife Management. Stewardship as a path to collaboration: exploring the role of identity and intergroup conflict among Michigan wolf stakeholders. Lute, M. L., and M. L. Gore. (2014). Human Dimensions of Wildlife, 19(3): 267-269. Exploring the ethical basis for conservation policy: the case of inbred wolves on Isle Royale, USA. Gore, M. L., Nelson, M.P., Vucetich, J. A., Smith, A. M., and M. Clark. (2011). Conservation Letters, 4(5): 394-401. Mass media coverage of Michigan’s 2014 wolf referenda. Gore, M. L. (2016). Report prepared for Michigan Department of Natural Resources, Wildlife Division. DOI: 10.13140/RG.2.1.4328.4880. Michigan Applied Public Policy Brief: Michigan Citizen’s Response to Gray Wolf-Related Risks. Improving the effectiveness of wolf management approaches in Michigan. Gore, M. L. (2014). Report prepared for Michigan Department of Natural Resources. Attitudes about wolf hunting as a tool to manage wolves: insights from 4 public meetings and an online survey. Gore, M. L. and M. L. Lute (2013). Report prepared for the Michigan Department of Natural Resources, Lansing, MI. Michigan Wolf Forum: December 2012. Michigan Wolf Forum: June 2012. Gore, M. L. (2012). Report prepared for the Michigan Department of Natural Resources, Lansing, MI. Toward improving the effectiveness of wolf management in Michigan: insights from a 2010 statewide survey. Lute, M. L. Gore, M. L., Nelson, M. P., and J. A. Vucetich. (2012). Michigan State University Department of Fisheries & Wildlife, East Lansing, MI.